The first solar powered house in Australia. 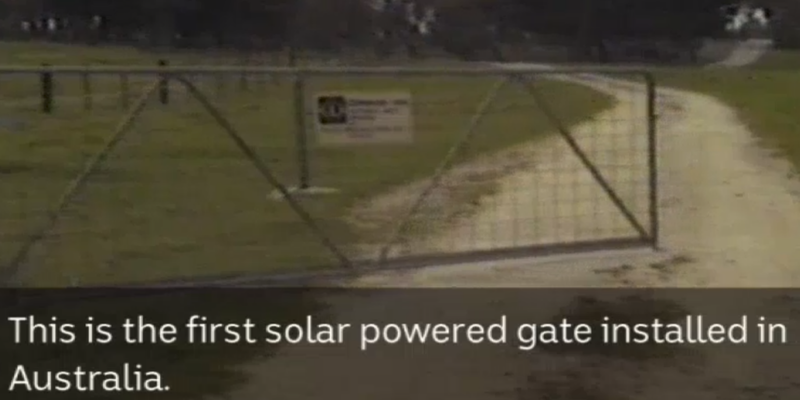 The ABC recently ran an article about the first solar powered house in Australia, the ‘Bos house’ – which was constructed in Victoria 40 years ago. A TV documentary ‘Breakthroughts’ called the house “the first totally energy-independent modern home in the world”. “We went into other houses, we found that their heating was blasting away and we didn’t need the heat, because the house stays the same temperature all the time,” Judy Bos told the ABC in an interview. The north-facing side of the Bos’ home is 98% glass, which means it absorbs as much warmth from the sun as possible. If it’s a hot day they have louvres throughout the house to control sunlight. Wind turbines power a dam pump and a 37,000 litre rainwater tank. “It was the first house that we knew of that was running exclusively on solar power,” said Michael Harris, who ran tours of the eco-friendly property in the 1980s. “Back in the 1980s people were very interested in being self-sufficient and being off the grid, and it was very difficult to do. The Bos’ property was different – where it has a string of polycrystalline celled solar panels to charge a cupboard full of lead acid solar batteries. According to the ABC, solar panels are now 15x more powerful than when the Bos’ place was constructed, and they’re also much, much cheaper. “This is a very old-fashioned solar house,” Ms Bos said. “We had to deal with what was available at the time … but now there are all sorts of materials that can be used. We’re expecting solar battery installation to increase quite substantially over the coming few years as the technology continues to improve and the cost decreases. Hivve – Solar powered school classrooms being trialled.